Whether your need is in a stadium, on a track, on dirt, snow or water, the Solo 2 will outperform competitive brands day after day. The Solo 2 measures the peak (release) and current speed in 2 active windows. 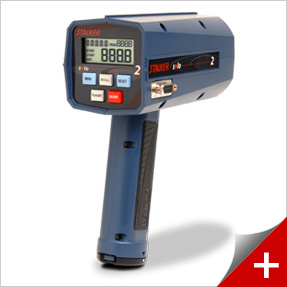 Quickly and accurately measure the speed of vehicles on land or water. The Solo 2 attaches to the side of a backdrop and measure the speed of midway game balls thrown from only a few feet away. Track tennis ball speed on serves and returns from courtside game after game. The engineers at Stalker Radar have designed the powerful Solo 2 sport radar from the ground up. The Solo 2 features newly designed software and algorithms created specifically for sports speed applications, measuring the speed of baseballs, automobiles, tennis balls, and in carnival games. Modern circuitry, components, and advanced manufacturing techniques add up to a smaller, lighter gun with no compromises in functionality. Package: K-Band Radar Gun; 6 NiMH batteries; wall charger; manual; and hard case. Uses common AA batteries - rechargeable NiMh with low battery indication. Modes: Baseball; car; tennis; carnival. Optional Accessories: 12VDC cigarette lighter receptacle adaptor; stopwatch cable; and Speed Sign cable.